FAT is usually considered as a villain in the diet of modern world. We consider Fat as the main reason behind Obesity and various diseases. But the truth is just opposite. You might be surprised to know that Fat is a very essential part of our body. Each cell in our body needs it and its shortage in body can generate various diseases and disabilities. Why do we usually consider FAT as a bad thing ? Usually people don't have control over their diet and consume Fat more than required. It creates the imbalance in our body and various diseases are caused due to it. Water is good for health, but if you drink it like a mad person, even that water will be harmful. Our body demands a balance of nutrition to remain healthy. We create the imbalance ourselves and then blame the Fat. Excess amount of Fat can't get into our body if we don't let it in. What are the good features of FAT for our body ? Fat acts as a source of heat and energy for our body. Each gram of fat can give 9 Calories while protein and carbohydrates can give just 4 to 5 Calories. It also acts as shock absorbing element on nerves, blood vessels and all important organs. If there is lack of fat on our buttocks then sitting on a hard surface will be painful. Even lying on back can be painful if a person is very skinny. Right amount of fat acts as a cushion attached to our body. Fat acts as insulation on on the nerves which carry electrical signals throughout our body. 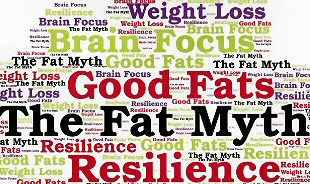 Our brain can't function properly without fat as it contain highest density of nerves. Fat is an important part of our skin. All cells have a cell membrane, which can't exist without fat. Dietary fat is important for growth and development of body. Our body can generate fat from extra calories but can generate some important fatty acids which are required for proper metabolism of body. There are some fat soluble vitamins, such as Vitamin A, D, E and K. These vitamins can't be absorbed by our body in absence of fat. Fat acts as an medium to transport these vitamins to different parts of body. Fat helps in formation of steroid hormones, which are responsible for some important functions in body. Saturated fat in our tissues gives rigidity to our body. All warm blooded animals have saturated fat for rigidity of body. Satiation Mechanism is that mechanism which creates a feeling of fullness of stomach after eating something. But this satiation mechanism is triggered by dietary fat. That is why fat-free foods are unsatisfying for our hunger. Dietary fat helps in utilizing the protein in our diet. Lack of fat will result in non-utilization of protein. Our body can generate Fat from extra calories, then why should we eat fat ? Our body can generate Fat from extra carbohydrate/calories that we eat, but it can't make some fatty acids required for proper metabolism. These fatty acids are generated from dietary fat only. Thats why sometime we call them EFA, Essential Fatty Acids, and we must ingest them through our diet. So now the misconception about Fat that its bad must have been removed from your mind. But still keep one thing in mind that proper balance is necessary. Fat is good only up to certain amount. Excess fat is harmful for body. Betterhealthfacts.com will bring more such information for you. Have a healthy life ahead !